A black and white photograph of the demolition of Peter Perry House in August 1982. This photo shows the original frame building after the bricks were removed. 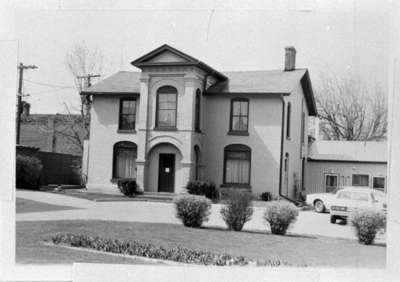 This frame house at 110 Dundas Street East was built in the 1850s or 1860s on the north side of Dundas Street, east of Brock Street. The home was built for Richard Hatch, a hardware dealer who came to Whitby in 1864. Later, this house was owned by Lyman T. Barclay, lawyer. In 1900, the home was given a brick veneer and from 1932 to 1981 it was the residence of the Town family. Before 1954, this building was used as a funeral chapel. It was demolished in 1981.